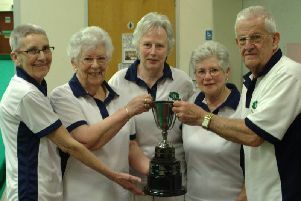 OLs finally got their league season off the starting line with this hard-fought win over old friends and rivals Leamington and in so doing retained the Brian White Cup, played for between the clubs in memory of a rugby stalwart who had strong connections to both clubs. OLs continue the attempt to find a solution to their midfield selection problem following the enforced retirement of star centre Troy Owen with a chronic knee injury. Ben Scott, by inclination and experience a winger, has been stepping in; but his absence through injury led to the selection of Andy Orbinson, the team’s regular number 8 forward, to wear the 13 jersey. He certainly played his part by shoring up the midfield defence with fellow centre Ben Roach, nullifying the best efforts of the Leamington back line who had plenty of ball to play with and looked to run it at every opportunity. It was the visitors who were on the front foot in the early stages of the game, dominating possession and territory but their best efforts foundered on the rocks of OL’s defence, a distinct step up from the defensive displays in the first two league games of this campaign. Having weathered this early storm, it was OLs who struck on their first excursion into the visitors’ 22. A Leamington scrum was disrupted and when the ball went loose, Dom Hammond broke towards the line and a delightful back of the hand offload was taken by the supporting Ben Anderson, the lock galloping over for a try. Jon Bean converted and OLs had a 7-0 lead. The first half continued in much the same vein with Leamington still having most of the territory but unable to find a way through OL’s defence, including a period when the home side were reduced to 14 following a yellow card. But the OL’s pack were increasingly dominant in set scrums, effectively cutting off any worthwhile Leamington possession from this source. Then on the stroke of half time came a score which had been threatened for some time, Hammond turning from provider to scorer when he caught the visitors’ defence napping to go over after another strong scrum by the home side and Bean converted his try for a 14-0 lead at the break. In the second half, OLs increasingly took control of the game and after ten minutes came the score which effectively sealed the points. Opting for a scrum when a penalty was awarded 10 metres from the Leamington line, scrum half James Collins feinted to pass right before switching the ball back to the narrow side, the ball perfectly delivered for wing Luke Townsend to run on to it at pace and go over in the corner, this coming shortly after Townsend had been held on the line after another strong thrust down the flank. Bean’s conversion attempt from wide out drifted narrowly wide. Much of the credit for this improved performance must go to the home pack who established a dominance over their opposite numbers that became stronger as the game went on. Ben Anderson won a ton of excellent possession in the lineout, including a couple of steals on Leamington throws, won two crucial turnovers in mauls and added a try for good measure. The front row of Dom Hammond, Olly Cowley and Chris le Poidevin won the scrummaging battle; and how useful to have a replacement prop like Karl Chaplow, back in an OL’s jersey for the first time in several years, to keep up the pressure in the second half. Hammond’s influence spread well beyond the set scrum, his try making it 4 this season so far; and the back row of James Orbinson, Ash Moore and skipper Charlie Seager were formidable in defence as well as an attacking force. This Saturday, OLs meet another old foe when they travel to Nuneaton Old Edwardians. Old Eds have had an excellent start to the season, winning all three league games so far and sitting 3rd in the table, so a stern test is expected. The OL’s 2nds made their second journey of the season to Leamington, this time for their Warwickshire League One fixture. With a vastly different side to the one that won the earlier game, OLs knew they would be up against it. With their forwards winning plenty of good quality ball, playing with an inexperienced back line told as OLs struggled to make any early possession tell. However, when Leamington had their share of possession and territory they easily managed to thread their way through the unfamiliar OL’s defence to score their first try on 10 minutes. The remainder of the first half was played from end to end as the hard ground and sunny conditions promoted a free-flowing, running game which did not suit the OL’s personnel. Unfortunately for them, Leamington scored a second try just before half time, leaving the score line 14 – 0 at the break. The introduction of new faces at half time saw OLs look more of a threat in attack. The returning Marc Eagles was to be a notable influence in the OL’s midfield. However, it was Leamington who scored the first try of the second half. Poor tackling saw the Leamington centres combining to score unchallenged under the OL’s posts. Undeterred, OL’s attacked trying to get a foot hold in the game. Their efforts were finally rewarded after sustained pressure deep within the Leamington half when Lee Arbuthnot bundled his way over the Leamington line to score, with fly half Zak Wright adding the conversion. With their first score on the board, OLs looked to maintain the pressure on Leamington. However, a yellow card to flanker Tom Cook a few minutes later did not help their cause. Whilst down to 14 men, and with a tiring defence, Leamington would put the game beyond OL’s reach with two tries to stretch their lead to 28 points. OLs were then to lose the influence of the experienced Gary Hammond to injury. The resultant change in personnel unsettled the OL’s pack, leading to Leamington turning the ball over near their line and running the full length of the pitch to increase their lead even further. OLs scored what was to be a consolation try with ten minutes to go. The pressure of numerous phases of play and hard direct running from the excellent Eagles saw the centre cross the Leamington line. Nathan Ruddell added the conversion. The final ten minutes of the game was again played from end to end and with both sides tired, either try line could have been breached. Unfortunately, Leamington would be the only side to add to their tally as two late tries enabled them to pass the 50 point mark. Although the effort of the players was unquestionable, this was a harsh lesson in organisation and commitment given to the OL’s team, but one that they can come back from with hard work put in on the training field. OL’s Colts continued their winning ways with a comprehensive win over a plucky Earlsdon side who struggled to contain the free-flowing game of the Fenley Field team. When Earlsdon suffered injuries to 2 key players midway through the second half, and with no adequate replacements left to call upon, it was agreed to bring the game to a halt with 15 minutes of the full quota still remaining. OLs got off to a flier with an early Ben Varney try. Cameron Buxton and Danny Price added to the score with further touchdowns before Varney claimed his second. With Price adding the goal points to three of the tries, OLs went into the half time break with a comfortable 26-0 lead. Matt O’Connor was first to cross in the second half, followed over the line by Rafa Cruz and Sean John before the game was brought to its premature end. Danny Price converted one of the second half tries for a personal tally of 13 points to add to his rapidly growing seasonal haul. The Colts entertain their counterparts from Broadstreet at Fenley Field this Saturday, a contest which is likely to test them somewhat more than recent games, against a club whose senior side was recently playing National League rugby.